I love all things barbecue flavored, but generally can't eat them because they contain red dye, something I'm really allergic to. 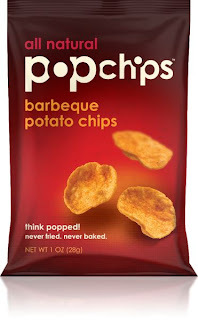 But since Popchips are all natural, they use naturally colored "red things" like tomatoes to make the chips reddish orange. Genius, huh? These little airy chips didn't let me down. They pack a great crunch and a nice barbecue flavor, and at only 120 calories per serving (19 chips) with 4 grams of fat, they really do make a great relatively healthy snack. With flavors like salt and vinegar, sour cream and onion, and cheddar, these little chips could easily take the place of their non-healthy cousins in my cupboard. If you're trying to start off the new year with "healthier ways," you should give these chips a try. What are your favorite relatively healthy snacks?